Welcome to the world where art evolve. Make yourself comfortable by having fun reading our articles about arts related. We’ll surely rock you with blog articles full of wisdom and art inspiration. Pin us now on your browser! Do you love playing air hockey? Do you have your own air hockey table since you just can’t stop having fun? Well if you really love playing air hockey and got yourself your own air hockey table, then step up the game to a whole new level by adding creative paint designs. You might have an old air hockey table lying idly in your storage so why not refurbish it a bit, make it new again then sell it to an arcade? Air hockey is such a fun game but having combined your own design will most certainly give a personal touch to your game and make it more enjoyable. You can even then sell it in your local arcade if want. So are you interested painting your own imagination? If yes, than here’s how. First things first! You should gather the following materials to get started with the paint job. Safety first! You will need a face mask to prevent hazardous air chemicals that you’d be working with along this task. Then you will need paint. Spray paints are the most recommendable since it requires little to no experiences of painting at all. Liquid paints are harder to use and much risky since it paints quite thick. Make sure you use spray paints. Next thing you will need is toothpicks. You will need sturdy toothpicks since you’re going to use these for covering up the holes, and breaking them can be quite nasty. Then you’ll need cardboards and a pencil. Cardboards will be cut into parts and be used as the basis of your layout. After that you should look for small heavy objects that you think would be convenient in pinning down the cardboard to keep the borders separate. Magnets or large batteries are great for this Another thing you will need is a pair of gloves, so you won’t have to worry about getting paint all over your hands. The last thing you will need for this project is sealer paint. Sealer paints are used to seal the surface and keep your table glossy. To achieve a great-looking air hockey table, you must first have a general idea of the design you want then plan out how you intend to reach this goal. This tutorial is only a general guidance for making your air hockey table more attractive but the end design depends on your skills and versatility in art. With the cardboard you can make cutouts of polygons and shapes that serves as the main layout for your artwork. Make sure the edges are finely cut. You can also check out the Internet for additional creative designs. Painting your table can be quite risky. You might get some of the air holes clogged up which would ruin the entire game. Always take high precautions all throughout the painting process. First, you will need to carefully search for the air holes and cover them up with toothpicks. Air hole sizes vary from table to table as well as air hockey brands, so you might need to improvise on how you’re supposed to cover these holes. Just always make sure that the air holes are secured and no paint can enter and cause air blockage. After all the preparation and precautions, we will now proceed to painting. Place the cardboard cutouts on the areas you want the shapes to be formed. Place the magnets to secure the cardboard. Then start spraying evenly throughout the selected area Do a lot of variations and style and make sure you improvise on the art you are making. After spraying the entire table you can wait for several minutes for it to completely dry up. Once you are sure it is completely dry you can now add a layer of seal paint to make it glossy. It will look insanely good with those shiny colorful designs more especially if you’re a skilled artist. Not only you make it better, you will also encourage people to play air hockey! Garment steaming is getting to be a common technique used to dc-wrinkle clothes. Its use is better than an on box. Hand-painted shirts took more hard work to be created and thus needed to take care of better. You can choose to use garment steaming as a way to clean your shirt. It would assist in maintaining the art as well as the quality of the shirt. It would remove all the wrinkles on your shirt with limited effects on its quality. PREPARE THE STEAMER. You should first prepare your steamer and make it ready for use Fill the tank of the water steamer with cold water. Close it properly to prevent leakages during the steaming process. Plug the steamer to a power source and allow it to steam. The steam should form nicely on the steamer before using it on your hand-painted shirt. You can press the trigger to see the amount of steam it will release. If the steamer warms well enough, it will offer you quality results. HANG THE HAND-PAINTED SHIRTS TO STEAM. Hanging is the best method you can use to heat your shirt well. If you are using the hand-held steamer, you may hang your shirt on the shower rod Ora cloth line. Upright steamers come with a pre-installed hanging pole where you’ll hang your shirts. STEAM YOUR SHIRT. You don’t need to hard press the shirt when you are steaming. The steam can remove the wrinkles without pressing on the cloth. Press the steam button frequently as you pass the steamer on your fabric, to apply adequate steam. If the shirt’s material is harder, you may use a pan to press on the shirt. This would assist in straightening the hand painting. If the shirt has a lot of wrinkles, you can steam it from the inside. Steaming from the inside will help in making the process easier and faster. The whole process would work to remove wrinkles on your shirt just like an iron box. It takes care of the art and the quality of the shirt, unlike the iron box. 4. DRY YOUR SHIRT. Once you have steamed your shirt well and all the wrinkles are stretched, you may aerate your shirt for it to dry. After the steaming process, the shirt would feel damp and probably have some water droplets on it. Your shirt will dry in approximately ten minutes depending on the humidity of the region. CONCLUSION. A buyer may wonder, will this be a garment steamer I can use for the next years? If you would know the merits of using a steamer, then it would be easier to answer the question. There are various benefits associated with using the steamer. Usability. Using the garment steamer is easy. You only need to let the steamer to form steam which you will use to stretch your clothes. Ever thought of bringing a facelift to your apartment or planned to change that old-fashioned colour of your furniture? One of the easiest solutions to this goal is spray painting. Spray painting is really an art that showcases our creativity. When compared with conventional and regular painting using a brush, this method of spraying dries quickly and won’t leave over any stroke marks produced by the paintbrush. Now, you can simply move around the house renovating your furniture without the help of any painter. Here are some of the tips by which you can excel at spray painting. Selection of the right canvas is the first, and possibly the most important, step in every spray painting project. And while at it, always keep in mind to spray on a wooden canvas that is same as the table saw height. This enables you to work more confidently and makes your work flawless. The canvas that you choose comes in different shapes and sizes, so you may want to do a little homework before choosing the right one for your project. If you are new in the field of wood painting, try to do a trial so that you are confident enough in working with furniture. As you are going to work on wood or furniture, it is prudent to have some knowledge about woodworking tools and how they are handled. Always keep your canvas dry and smooth as this helps in the even distribution of paint throughout the canvas. 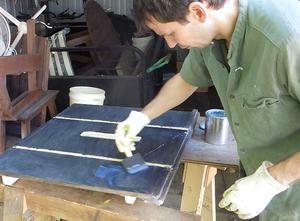 Remember to use sandpapers and apply primers to remove any adhesives present on the canvas. You can use a portable paint sprayer if you need enough wiggle room when spraying. However, make sure that the nozzle of the sprayer is free from any dirt or leftover paints. It is recommended to clean the sprayer and its nozzle after completing each work. It is always advised that you read the instructions present in the spray paint for more detailed information on how to go about the whole business of spraying. But as a general rule, it is ideal to work with spray paint in a temperature range between 50F and 90F, and when relative humidity is below 85%. Also, do not spray in direct sunlight, and it is not advised to spray-paint in hot weather as the aerosol spray paints are highly inflammable. Also, remember to cover your face and nose. Last but not least, do not paint in a windy environment or with the fan is switched on. You won’t get a fine finish by a single coat, so you can go for multiple coats to make your work a masterpiece. However, it is important to know about the recoating time as is mentioned in the can. Do read the instructions carefully. The amount of the paint applied will reflect the quality of your work. It is not the quantity of the paint that determines the overall outcome, but rather how perfectly you play around with the coatings. The paints are available in various brands, and each of them differs accordingly. So, try to do proper research before you buy any spray paint. Reviews about various brands of spray paints are readily available on the internet, so invest some time in reading them. The above are just some of the common tips that you should keep in mind, but we have certainly not exhausted the list. If you have good knowledge about woodworking tools and know how to handle those tools, you can make your work even more beautiful. Whether you are trying to bring an old cast-iron table saw back to life or you just want to give your modern table saw some TLC, this guide can help you with a different type of table saw care and maintenance for a clean, safe, and attractive power tool. Especially with older cast-iron models of table saws, your specimen might have some accumulated rust on the body, tabletop, feet, legs, or many other places on your table saw. It’s always easier to work on a tool if you disassemble the pieces you’ll need to access for cleaning just like the commonly used miter. If you aren’t sure how to disassemble your table saw, take a moment to search online for a user manual or tear-down guide. It’s often amazing what you’ll find on user manual database sites that carry original scanned manuals for long-defunct brands and models. If you still can’t find the instructions for disassembly, do your best to find an online forum or even a tool repair shop to point you in the right direction. Disassembly is a great opportunity to learn about your tool and the inner workings. Aside from the learning experience, this activity offers you a chance to inspect the inside of your table saw for wear and fatigue in the “guts” of the tool. Have a look for rust, dust, and worn-out belts or fasteners under the hood using a circular saw which is the one for you. Before you have your saw apart, it’s always a look idea to prepare a workspace for cleaning and painting. Clear off your workbench or create a painting table with some sawhorses and an old table top. Use a drop sheet to collect dust and stray drops of paint. Get your cleaning supplies, solvents, brushes, and scrapers ready before you crack open the paint can. Cleaning comes first, so take the time to inspect your parts for rust and discoloration. Start with a hard edge tool like a razor or paint scraper to remove the surface rust. Then come in with your sandblasting or sanding tool to remove the remainder. When working with sanding tools, it’s very important to use safety gear for your respiration, hearing, and vision. Don’t take any chances with your health and safety in the shop! After you clean up the rust and grime on your table saw, it’s time to start painting. Purchase a high-quality rust paint in your preferred color. If you are the creative type, you ought to consider personalizing your saw with a bold hue or a custom logo for the base of your saw. Don’t forget to give your fence assembly some TLC with a good cleaning and fresh coat to match the rest of your table saw. After you finish your table saw painting project, use the opportunity to give the motor a good air blasting to clean the brushes and remove the lifetime of debris you’ll find inside. After everything is clean, painted, and dry, you can begin the reassembly process. Follow the disassembly steps in reverse and take your time not to bend or stress any of the connecting parts and fasteners. Don’t rush or you may regret taking this project on in the first place! I hope you enjoy your brand-new paint job on your shiny table saw, and thanks for reading. The origin of Ping Pong dates to the Victorians when upper-middle-class families decided to take the lawn game of tennis inside. A bit of light entertainment after a splendid dinner, guests would use the dining room table to bounce small ping pong balls across in a hope to get the other player out. The sport itself evolved and took on an array of different names, most commonly “Table Tennis”, but the principle stayed the same. Now, like so many other sports it has been immortalized in the art for all the world to remember, some even lend themselves to the more abstract eye. Most traditional paintings show two players either end of the table volleying a ball to each other, some rather realistically the art of motion is something that is quite tricky to capture but with a sport that is played in such small proximity, it seems that it is a better subject to show such movement (Example: a player play well using the best paddle). Often, however, players are not painting in a realistic tone, but more of a general wash of color as the focus on the painting is on the table, the ball or even the small paddles used in the game. Bold colors are used to attract the viewers’ attention, the signature pillar box red of the paddle is always a reference for what the painting is of. It is also interesting to note that the majority of paintings show the players to be well-dressed: wearing smart trousers and polo shirts with jumpers on, almost communicating that it is a gentleman’s game. This type of artwork can normally be found within the walls of small village cafes, or seaside art galleries, a small niche of work that is only eye-catching for a select few. The more realistic and vintage styles of paintings, however, are much more likely to grab your attention, due to their lavish exploration of not only the game of ping pong itself but the setting of a Victorian dining room with ladies and gentlemen alike engaging in a light afternoon of friendly sport. Photographs of the sport are much more easily acquired although not in so much depend on the art market. Photographs gather the true feeling of the player as they serve or volley in a game, giving an almost pained look on the subject of the picture. Now the subject has changed from the game to the player themselves and it is quite striking the way in which someone can contort their body to make a shot and how well a photographer can time their camera to just capture that very moment, where you’re not sure if the player has broken their armor just made an unbelievable shot to win the game. You can’t compare prices for these moments captured happy faces because of victory. Either way, the sheer concentration and determination to win at a game that started out as after dinner entertainment is something that brings the photographs to life, as well as the moments of pure genius when the photographer is able to bring a fast-moving world to a halt in one click of a button. Global Positioning System (GPS) is a new technology in getting positions of specific objects. Currently, it is a widely used technology, which makes navigation easier. It uses satellites with gadgets which have inbuilt gadgets to help in receiving of information. Aviation and trucking firms are the most famous areas which widely uses this technology. A gallery displays all the artifacts from these GPS gadgets for research, historical display and even for fun. The system has different capturing techniques which can be stored in a gallery as a reference point to even display milestones the system has made in using the GPS system. The major aim of GPS galleries is to portray a sense of art. GPS provides a 3-dimension drawing while at the gallery, you can have a display of the same in a 2-dimesion drawing, which is hand drawn or scribbled by a computer. Currently, most of the gadgets which use mobile technology have an inbuilt GPS technology in them, although they have limited functions compared to a GPS device specifically designed for navigation. What are some of the contents of a GPS gallery? Cyclists and runners can define their course of actions run by getting their routes. You cannot get lost, furthermore, it also provides additional information like prevailing weather conditions, type of terrain and any other relevant information. As a runner or a cyclist, you can now draw your route while deleting unnecessary information. Similarly, long distance runners in their course of practice also need GPS system as a guide to unfamiliar places. Renowned cyclists put all these collections of drawings in a public gallery or personal gallery in their home to act as a point of reference for future use. You can also just have a drawing of a new place you visited just for fun and share it in social media pages as a guide to anybody who might have interest. There is massive reduction of vehicle theft internationally, this is attributed to innovation of the GPS system with heavy duty battery to make sure it won’t die when you most need it. Since it uses a GPS satellite, be sure you can trace your vehicle irrespective of the remoteness of the place. Car hire businesses have really benefitted from this technology. Once you have the GPS photographs, you can now make your own drawings to get the shortest and the best route to save on fuel so that your customers reach their destinations on time. Traffic jams is a social challenge in most modern cities hence the system will be of help. Pilots and stakeholders in the aviation industry also need vital information for safe landing and taking off of planes. Initially, they relied on old navigation methods, which had their own share of challenges. GPS system solves most of these problems. Drawings of the same can be as a stock so that when there is a system failure you can have a backup from the current technology. GPS galleries are the best store for GPS drawings. They have numerous functions for individuals and public.